Leprechauns, clovers, kissing the Blarney Stone, green Guinness, and corn beef and cabbage — it’s that time of year again — helloooooo St. Patrick’s Day. Not many of us know what St. Patrick’s Day is really about….besides drinking green beer all night long in college, I never stopped between rounds to ask anyone why St. Patrick’s Day is celebrated. After all, I wasn’t Irish…far from it, yet there I was downing my fourth pint sing my love to my native (ok, fine, adoptive) Ireland, with the rest of the bar. Oh, how I love my Emerald Isle. Don’t judge me; you know you did the same thing in college. So I ask you, what’s a leprechaun and what do they have to do with St. Patrick’s Day? And what’s the significance of a Shamrock? And more importantly, how did they make the beer green? (A question I probably should have asked BEFORE I drank so much of it.) All I’m saying is if you’re going to celebrate a holiday as an honorary Irishmen for a night, you probably should have some background. Right? 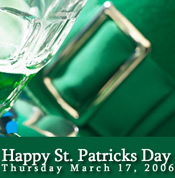 So, for all those college kids out there who are looking forward to March 17th with baited breathe, or for all those in their mid-thirties who are listening to their kids fight about Lego in the other room while dreaming of those college days, here’s some useful and interesting information about St. Patrick’s Day. St. Patrick was born in 385 A.D., but he wasn’t Irish, he was British or Scottish… no one really knows for sure. More interestingly, his birth name wasn’t St. Patrick…it was Maewyn Succat. When he was 16 years old, he was kidnapped and sold into slavery in Ireland. During his slavery, he became intensely religious, and used his belief in Christianity to help him endure his slavery. After six years, he escaped to France at age 22, became a priest (and later a bishop), and took the name Patrick. St. Patrick became a missionary with the goal of converting the people of Ireland to Christianity. He established the Catholic Church throughout the Emerald Isle, traveling throughout the country preaching and teaching Christianity, as well as opening schools and monasteries. He convinced many of the Irish to convert by using a three-leafed clover or Shamrock as a metaphor for the Trinity (the Father, Son, and Holy Spirit). Legend says that St. Patrick beat on a drum and drove all the snakes out of Ireland. Snakes (serpents) have always been a pagan symbol representing evil and thus it is widely thought that St. Patrick was responsible for driving paganism out of Ireland. St. Patrick died on March 17, 461 A.D.
Today, St. Patrick's Day is the day to wear green, kiss the Blarney Stone (we’ll get to that later), and celebrate being Irish (or in some cases, choosing to be Irish for a day). True or False? Green was not the original color associated with St. Patrick’s Day. The answer is true. Blue was the original color of St. Patrick’s Day and can still be seen on ancient Irish Flags. The color green was later adopted by Ireland in the 19th Century because green is representative of spring, fertility, life, and of course the shamrock. Ireland is also known as the "Emerald Isle", because all the rain and mist they receive keeps the land green and fertile. On St. Patrick’s Day, the phrase "wearing of the green" means that people wear green Shamrocks (the three-leaved plant that St. Patrick used to explain the Trinity) on their lapels to protect them from evil spirits and watch over their souls. In the United States, there is a tradition that if you don’t wear green on St. Patrick’s Day, you’ll get pinched. What is a Leprechaun anyway? The only Leprechaun most of us know is on the box of Lucky Charms — and he seems like a jolly fellow, right? However, according to tradition, Leprechauns aren’t so friendly; in fact they are sly and untrustworthy. Folklore states that Leprechauns are two feet tall Irish fairies. They are shoemakers that live alone and have a pot of gold that they hide at the end of a rainbow. Legend says that if you hear his hammer you can find him. If he is caught, he must tell you where the pot of gold is, but if you take your eyes off of him for even a second, he will disappear and take the treasure with him. What is the significance of the Shamrock? Shamrock which means "little clover" is a three-leaf clover. Legend says that St. Patrick used a three-leaf clover to explain the Christian Trinity (the Father, the Son and the Holy Spirit) to help convert the Irish to Christianity. To this day, Shamrocks are considered good luck and are worn on the lapels of the Irish on St. Patrick’s Day. There are many stories surrounding why the four-leaf clover is lucky. One story is that when Adam and Eve were thrown out of Paradise, it is said that Eve took a four-leaf clover with her as a souvenir. She kept it with her as a reminder of her happy days in Paradise. It is said that finding one in one’s own garden will bring you the same kind of happiness. On a more religious angle, some say that clover represents the arms of the cross, while others believe that the four leaves describe the points of the compass: north, south, east, and west. Some even say that finding a four-leaf clover will prevent madness. The Blarney Stone is located in the wall in Blarney Castle tower in the Irish village of Blarney. Legend says that kissing the stone will bring the kisser the ability to speak sweetly and persuasively. However, reaching the stone to kiss it can be very difficult. It is said that kissers have to lie of their back, hold on to a bar, and turn upside down to kiss the stone. The story states that a king saved an old woman from drowning at the Blarney Castle. To thank the king for saving her life, the old woman cast a spell giving the king the ability to speak sweetly and persuasively. Add 4 to 6 drops of green food coloring to one pint of light colored beer. Add the sugar and stir in the coffee. Float the whipped cream on top. Cut an "X" in the top and bake on a greased baking sheet for 45 to 50 minutes. Put a few drops of green food coloring in any Sprite-type. For an extra added touch, add green frozen grapes to each glass in place of ice cubes. Make you favorite sugar cookies and add a few drops of green food coloring to the dough, or you can add a few green drops to any white cake mix. Green beans, Green mashed potatoes (with a few drops of food coloring), lima beans, lettuce, grapes, kiwi, cucumbers, green peppers, green apples, broccoli, green pudding (pistachio) , olives, pickles, lime sherbet, celery, and even milk with a few drops of green food coloring. For most foods (especially liquids), a drop or two of food coloring goes a long way. Lighter-colored the food is easier to turn green and will look better. Shamrock means "little flower or little clover" in Irish. Abraham Lincoln carried a four-leaf clover around with him wherever he went for most of his life. It was said to be his good luck charm. Some say that one of the few times he didn’t carry it with him was the night he was assassinated. In ancient times, some priest thought that carrying a four-leaf clover would allow them to see witches and demons.